Not too long ago, iA Writer added a new font to its app, iA Writer Duospace font. Their introduction post is here, In Search of the Perfect Writing Font. Is Duospace perfect? I suggest that there is no such thing as a perfect writing font. I find iA’s “Papa knows best” attitude towards writing fonts…irritating. For my own purposes, I find Ubuntu Mono to be the best (free) writing font available. But let’s examine iA’s claims. iA’s arguments are first, that a monospaced (or nearly monospaced) writing font says that “this text is work in progress,” as opposed to a proportional font, which says “this is almost done.” Second, they argue that their new Duospace font (which has 1.5 times the monospaced width for the characters “m”, “M”, “w”, and “W”) maintains that “raw text feel” while avoiding the “artificial mechanical constraints” of the old typewriters. They further argue that a monospaced(ish) font slows down reading speed thus forcing a more appropriate writing speed. Finally, they bring up the fact that a monospaced(ish) font makes typos more obvious. First, I absolutely agree that a monospaced(ish) font makes typos more obvious, and this is important to me. As for slowing down reading to a “writing pace”…this is a point I’m unwilling to stipulate. Do monospaced fonts slow reading speed? Are there studies? If so, is this really a good thing for writing? Again, are there studies? I have questions other than the subjective “raw text feel” or the possible “writing pace” issues that are more important to me. Does the font I’m using for writing do everything possible to make errors stand out? Do I have to squint to see errors? Are errors obvious when the print is on the page or the spell checker is off? Since I’m my own publisher, the answers to these have to be “yes,” “no,” and “hell yes,” respectively. This is why I use Teletype-derived writing fonts—of which I find Ubuntu Mono to be the best. Not every monospaced font traces its lineage back to typewriters. The programmer’s (or code) fonts (Monaco, Source Code Pro, even Duospace, et. al.) trace their lineage back to the Teletype A33. Cheap typewriters had as few separate characters as possible. Many didn’t have a separate key for zero, for numeral one, or even for an equals symbol. Instead, you used a capital oh, a lowercase el, and backspaced to put an underscore beneath your hyphen to fake an equals symbol. If you succeeded in selling your work, people called “type setters” would retype it, making it look beautiful with distinct characters for typographic quotes and other glyphs that a typewriter couldn’t produce. That’s why typewriter-derived fonts often have hard-to-distinguish glyphs. In the bad old days, they were faked, so why distinguish them now? Teletypes, on the other hand, were the first devices that gave humans the ability to interact directly with computers. There were no lowercase letters on the early models (part of why many programming languages are case-insensitive.) But you bet there were distinct numerals versus letters. You would never mistake a Teletype zero for a capital oh. You wouldn’t catch it expecting you to back up and underline your hyphen to fake an equals symbol. Modern code fonts are derived from Teletypes. Zeros are slashed or dotted. Numeral ones and capital eyes are distinct. Lowercase el can’t be mistaken for anything else. Sadly, typographic quotes (English “smart” or “curly” quotes) and dashes (en dash and em dash) are afterthoughts in most monospaced fonts, whatever their derivation. 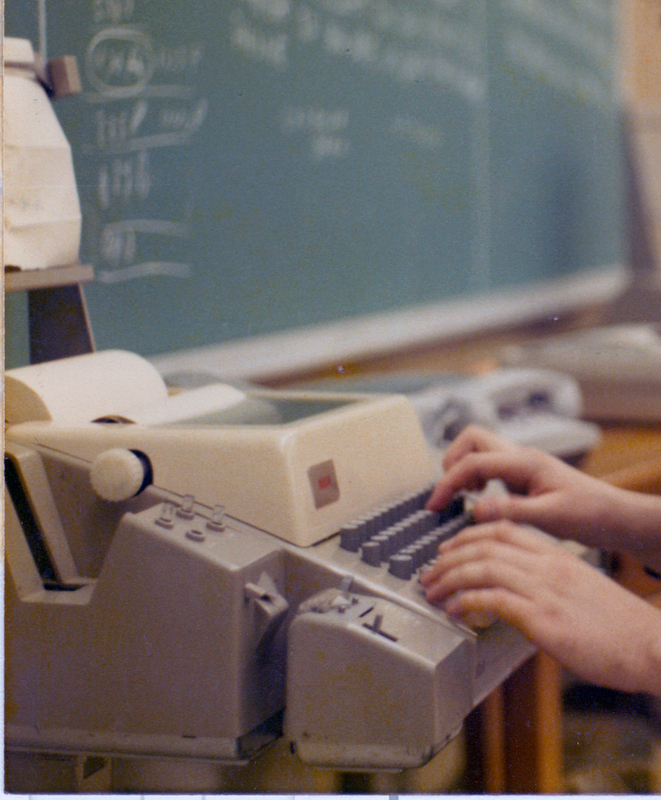 They weren’t on Teletypes; they weren’t on typewriters; they were added for the first graphical computer UIs in the early 1980s. It shows. I usually can’t tell whether a quote in a monospaced font is an open or a close quote. Often the dashes and hyphens are identical or one pixel different. Ubuntu Mono is an exception. It’s easy to distinguish English typographic quotes from each other in Ubuntu. It’s obvious whether you’ve used a hyphen or a dash, and if a dash, which. And it retains all the letter v. numeral v. symbol distinguishability of a proper code font. Therefore, for me, by my own priorities, Ubuntu Mono is the best free writing font available. But all this is aside from questions such as: what font would be best for a dyslexic writer? A partially sighted writer? A writer with any of many other challenges that mean the iA paradigm or mine must yield to other considerations? A writer who simply finds monospaced fonts irritating? A font that looks handwritten might convey that “not done yet” feel even better than monospaced. A dyslexic writer would choose that font which triggers her disability the least. I suggest that “best” is dependent on individual priorities. Mine aren’t yours. So I believe the “perfect” writing font is a myth. I hope this article helps you on your way to choosing a writing font that helps you write more easily.